Vincent Bechen Jr. was born in 1933 at South Dakota. He was the son of Vincent Joseph Bechen and Rose Agnes Novotny. Vincent Bechen Jr. died in 2000. Chris Nelson was born at Pennsylvania. He married Hetta May DeCamp, daughter of Emmett Woodson DeCamp and Ann Eliza Howe, before 1904 at first marriage for her. Chris Nelson died before 1907. Hiram E. Nelson was born circa 1904 at Iowa. He was the son of Chris Nelson and Hetta May DeCamp. Walter Edgar Welch Jr. was born on 12 December 1909 at Missouri. He was the son of Walter Edgar Welch Sr. and Hetta May DeCamp. Walter Edgar Welch Jr. died on 6 December 1984 at Iowa at age 74. 1 January 1925 Des Moines Ward 3, Polk, Iowa Walter Edgar Welch Jr. appeared on the census of 1 January 1925 in the household of Hetta May DeCamp at Des Moines Ward 3, Polk, Iowa. John Welch was born circa 1916 at Iowa. 1 January 1925 Des Moines Ward 3, Polk, Iowa John Welch appeared on the census of 1 January 1925 in the household of Hetta May DeCamp at Des Moines Ward 3, Polk, Iowa. Oscar Welch was born circa 1913 at Missouri. 1 January 1925 Des Moines Ward 3, Polk, Iowa Oscar Welch appeared on the census of 1 January 1925 in the household of Hetta May DeCamp at Des Moines Ward 3, Polk, Iowa. Maisey Welch married (?) Gibson. Maisey Welch was born circa 1912 at Missouri. She was the daughter of Walter Edgar Welch Sr. and Hetta May DeCamp. 1 January 1925 Des Moines Ward 3, Polk, Iowa Maisey Welch appeared on the census of 1 January 1925 in the household of Hetta May DeCamp at Des Moines Ward 3, Polk, Iowa. (?) Gibson married Maisey Welch, daughter of Walter Edgar Welch Sr. and Hetta May DeCamp. John Moore married Ida DeCamp, daughter of Madison DeCamp and Jane Saunders. John Moore was born circa 1855 at New York. Married Name before 1925 As of before 1925,her married name was Bray. Orella Moore was born circa 1890 at Iowa. She was the daughter of John Moore and Ida DeCamp. Orella Moore married (?) Bray before 1925. 1 January 1925 Des Moines Ward 5, Polk, Iowa Orella Moore is listed as sister-in-law on the census of 1 January 1925 in the household of William K. Simpson at Des Moines Ward 5, Polk, Iowa. (?) Bray married Orella Moore, daughter of John Moore and Ida DeCamp, before 1925. Married Name before 1925 As of before 1925,her married name was Simpson. Stella Moore was born circa 1885 at Iowa. Stella Moore married William K. Simpson, son of William Simpson and Addie Kendall, before 1925. 1 January 1925 Des Moines Ward 5, Polk, Iowa Stella Moore appeared on the census of 1 January 1925 in the household of William K. Simpson at Des Moines Ward 5, Polk, Iowa. William K. Simpson was born circa 1879 at Iowa. He was the son of William Simpson and Addie Kendall. William K. Simpson married Stella Moore, daughter of John Moore and Ida DeCamp, before 1925. 1 January 1925 Des Moines Ward 5, Polk, Iowa William K. Simpson appeared on the census of 1 January 1925 at Des Moines Ward 5, Polk, Iowa. William Simpson married Addie Kendall. William Simpson was born circa 1854 at Iowa. Addie Kendall married William Simpson. Addie Kendall was born circa 1853 at Iowa. Ida DeCamp married John Moore. Ida DeCamp was born circa 1860 at Iowa. She was the daughter of Madison DeCamp and Jane Saunders. Madison DeCamp was born at Ohio. Madison DeCamp died before 1925. Married Name Her married name was DeCamp. Jane Saunders married Madison DeCamp. Jane Saunders was born at Pennsylvania. Name Variation Marvin E. Cave was also known as Marvine E.
Marvin E. Cave was born circa 1882 at Iowa. He was the son of Granville Cave and Rhoda A. DeCamp. Marvin E. Cave married Nellie Schoberg before 1915. Marvin E. Cave died after 1925. Married Name before 1915 As of before 1915,her married name was Cave. Nellie Schoberg was born circa 1884 at Iowa. She married Marvin E. Cave, son of Granville Cave and Rhoda A. DeCamp, before 1915. Russell V. Cave was born circa 1915 at Iowa. He was the son of Marvin E. Cave and Nellie Schoberg. Edward R. Meyer married Lucille M. Riggert, daughter of Ernest W. Riggert and Maria Bertha Dorothea Hennings, before 1940. Name Variation Stanley Edward Meyer was also known as Stan. 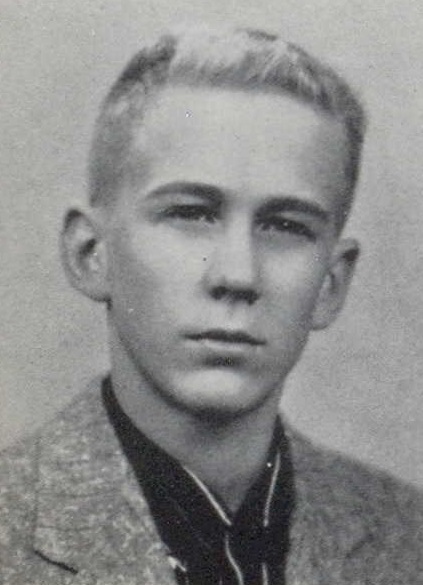 Stanley Edward Meyer was born on 21 June 1940 at Reedsburg, Sauk, Wisconsin. He was the son of Edward R. Meyer and Lucille M. Riggert. Stanley Edward Meyer was baptized on 14 July 1940 at St John Lutheran Church, Reedsburg, Sauk, Wisconsin. He died on 31 December 2012 at age 72 Stanley Edward Meyer, age 72, of Reedsburg, was born on June 21, 1940, died at his home, Monday, December 31, 2012 of heart failure. The son of Edward R. Meyer and Lucille M. Riggert, Stan grew up in Reedsburg where he attended school graduating in 1958. He was a construction estimator with Brady Farrell Construction in Madison in the late sixties. He later moved back to Reedsburg and started his own construction business. In the seventies, he went to work with Marshall Erdman Associates of Madison as a construction superintendent where he built and remodeled medical buildings all over the country. In the early eighties, he worked with INNOMED Corporation as a superintendent as well. After a serious illness, he went to work for his good friend, Tom Hanson, driving semi for C & H Distributors. He later drove for Heding Trucking of Union Center until his retirement. After his retirement, he and his wife, Joice, enjoyed several winters in Arizona. For the last several years, they took their RV and spent winters working as volunteers in the Florida State Parks. He married the former Joice Mittlesteadt on May 6, 1961. He is survived by his wife, Joice; two sons: David and Kurt; three grandchildren: Dylan Henderson, Jeremiah Meyer and Alexandra Meyer; his stepmother: Eleanor Meyer; his stepsister: Donna (Tom) Marquardt; two aunts: Kate (Norman) Lindloff and Ann Meyer; his brothers-in-law: Tom and Bill Mittlesteadt, David (Nancy Sheahan) Mittlesteadt; his sister-in-law: Jane Szopinski; good friends: Mick and Luanne Krohn, Judy and Marvin Bloss; and his faithful Yorkie companions: Peanuts and Willie. In keeping with his wishes, Stan will be cremated and a celebration of life gathering will be held at a later date. The Hoof Funeral Home is serving the family. Stanley Edward Meyer graduated in 1958 at Webb High School, Reedsburg, Sauk, Wisconsin. George Meyer was born in June 1839 at Germany. He married Sophia (?) circa 1872. George Meyer died after 1910. George Meyer immigrated in 1863 also reported as 1867. [S245] U.S. Federal Census 1900 U.S. Federal Census, by Ancestry.com, Year: 1900; Census Place: La Valle, Sauk, Wisconsin; Roll: T623_1816; Page: 8B; Enumeration District: 139. [S244] U.S. Federal Census 1910 U.S. Federal Census, by Ancestry.com, Year: 1910; Census Place: Reedsburg Ward 1, Sauk, Wisconsin; Roll: T624_1736; Page: 4B; Enumeration District: 0123; Image: 1116; FHL Number: 1375749. Married Name circa 1872 As of circa 1872,her married name was Meyer. Sophia (?) was born in May 1858 at Germany. She married George Meyer circa 1872. Sophia (?) died after 1910. Sophia (?) immigrated in 1868. She had 3 with 3 living in 1900 (appears to only include those living with them) children. She had 8 with 6 living in 1900 children. Hilda Meyer was born in January 1886 at Wisconsin. She was the daughter of George Meyer and Sophia (?). Della Meyer was born in November 1888 at Wisconsin. Elsa Meyer was born circa 1884 at Wisconsin. Arthur Struck was born in April 1887 at Wisconsin. He was the son of Henry K. Struck and Mary S. Bliss. [S245] U.S. Federal Census 1900 U.S. Federal Census, by Ancestry.com, Year: 1900; Census Place: Dellona, Sauk, Wisconsin; Roll: T623_1816; Page: 4A; Enumeration District: 130.